I am so happy to announce the release of my book, Theep and Thorpe: Adventures in Space, March 25, 2016. It is available now at the Createspace eStore and Amazon.com. It’s a paperback book for young readers and for those who are young at heart. The kindle version will be available soon. 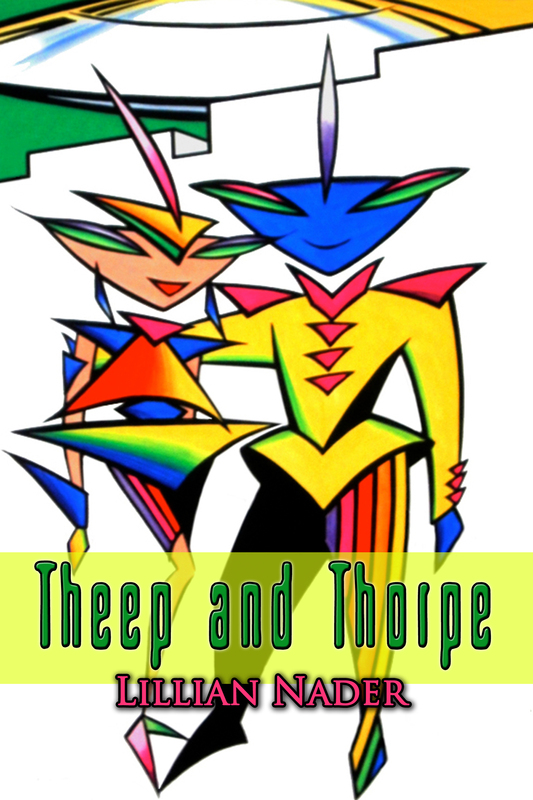 The concept of Theep and Thorpe began many years ago when my artist friend, Angelo Divino, created images of two space beings and asked if I wanted to write about them. Of course, I said yes! Their names came to me first as I pondered the idea of how space beings might communicate. I decided they would know one another by their sound frequencies rather than names. Each sound frequency would be as distinguishable as a human’s voice or fingerprints. Since we can’t pronounce these frequencies, the names Theep and Thorpe are used as a close facsimile. I knew Theep and Thorpe were speaking to me. I had tried to write their story before, but nothing seemed to flow. Now, with the support and encouragement of a writers’ group, the time was right to write my science fiction novel. Jonathon is a fourteen year old protagonist of the story who ends up in a reform school in outer space in the year 2160. He and other inmates are required to grow their own food. While trying to figure out what farming in the future would be like, I got an email from my friend, Lucy Martin. Her husband, Jerry, had purchased a Freight Farm. I had no clue what that was, but my research and the information they sent me led me to writing about hydroponic farming as part of my book. Thank you, Lucy and Jerry! Additional research was needed to know what kind of weapons might be used in the future. I came up with the term, “flip-phaser,” the type of gun used on Star Trek. It’s a laser gun with a nozzle to flip for different settings such as stun or Kill! Early in the story, Jonathon gets into trouble when he’s caught in possession of a flip-phaser. Later in the book, rail guns are used in a spaceship battle. Rail guns are projectile weapons that can reach vast distances to shoot through walls of naval ships and spacecraft. If you read and like the book, kindly write a favorable review to post on Amazon and Goodreads. This entry was posted in Uncategorized on March 26, 2016 by Lillian Nader.